Agumbe in Karnataka in the district of Shimoga is a very famous hill station.Agumbe is situated at a distance of about 380 Kms from Bangalore and 100 Kms from Mangalore.This hill station is also popularly referred as the Cherrapunji of the south for it recieves a high rainfall in the south and also the second highest in India.Agumbe with its magnificent sunsets,radiant sheen and sparkling luster of water streams and uncorrupted picturesqueness is an ideal hill station location for holidays.It was Agumbe which gave life for the film Malgudi Days,based on RK Narayan's novel for it was entirely shooted here.Agumbe and its surroundings are filled with thrilling and adventurous trekking routes.It is also referred by the people as trekker's paradise.Agumbe houses the Rainforest Research Station which is the only permanent rainforest research station in India.Now Augumbe is also equipped with Indias first automatic weather station exclusively to monitor changes in rain forests and the person behind this herpetologist and Whitley gold awardee Dr Romulus Whitaker. Situated between the Shimoga and Dakshina Kannada Districts, the hill station of Agumbe is frequented by many to enjoy the unparalleled beauty of the Western Ghats and the Arabian Sea. Gopalakrishna Temple is a 14th century temple which exhibits Hoysala Art and is a major tourist attraction. This is a beautiful place which you a 7 kilometers drive from Agumbe.It got its name from "Barka", the mouse deer and "kana", meaning home.Barkana has a spectacular waterfall which falls from a height of 850 feet.A V-shaped valley is visible from the viewing platform nearly 2000 ft high above sea level with river Sita at the center. The Agumbe Rainforest Research Station which is now managed by Mr. Gowri Shankar was originaly established by the herpetologist, Romulus Whitaker. This is a place from which one get an amazing Sunset and Sunrise. The tourists travel a distance of about 14 kilometers from Agumbe to see this beautiful sight. 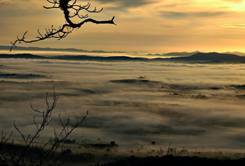 It is situated at a height of about 900 meters above the sea level. This place also houses the temple of Humcha Jain Mutt whose main attraction is a pond which is percieved to never dry. This is more than a century old place in Augumbe and is the famous eat out here. The person in charge and who runs this eat out is "Kasturiakka" who is the most popular person in and around Agumbe.Along with food Doddamane also helps the tourists by providing home stays. Though the place doesnt have any menu card it guarantees you a very healthy food. The Kudlu Teertha falls which is at a distance of about 20km from Augumbe is a very beautiful waterfall of about 126 feet. The water drops from the top to the bottom in one big leap and is great sight to watch lying there on your back. To trekk to Kudlu Theertha Falls one has to take a left detour before 6 kms to Hebri, another left after another 3-4 kms. The road will end at the banks of river Sita.There is a Burma bridge on the right side to cross the river. After that one has to walk for 4 kms inside the jungle. There will be a small stream which has to be crossed to reach the foothills and from here a 3-4 kms of trekking will take you to this location. 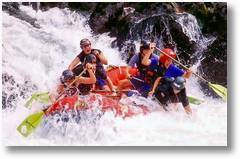 This is an ideal location for rafting and to reach this you will have to take a diversion 4km before the town of Hebri.Apart from rafting you can also take a boat ride here. If interested there are guides who can take you on a trekk to the Kudlu Theertha Falls from here. Jogigundi falls got its name from a saint named Jogi who used to meditate here. This is a ideal picnic spot at a distance of about 3 kilometers and it takes 10 to 15 mins to reach from Agumbe.This is actually a small pond whose origin is of the river Malapahaari which in turn is the tributary of river Tunga.The water to the pond makes its way through a cave around 30-50 ft deep. The cave is like a natural water cooler and is carved by the flowing water for many years. The hiking route to this place can promise you with leeches especially towards the last 500 mts of the hike. Onake Abbi water fall comes from a height of about 500 feet and it takes a trekk of about 4 kms from Agumbe.You will have to trekk through the Medicinal Plants Conservation Area and if lucky you get the sight of splendid rainbows.The hike of this fall is again filled with leeches. About 55 km from Agumbe is Udupi, one of the important Vaishnavite destinations with its famous Krishna temple and eight mutts. Udupi's chefs are known for their culinary skills worldwide. Shringeri is known for its Shankara Mutt, also called Sharada Peetha, established by Adi Shankaracharya. Shankara is said to have spent twelve years of his life in Shringeri. 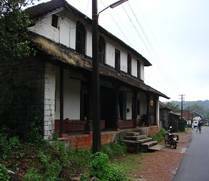 By Rail Bangalore is the nearest railway station to visit Agumbe. There are two ways to reach Shimoga from Bangalore (Bengaluru) from where you can go to Augumbe.